I was recently contacted by Pink Clove to see if I wanted to review a couple of there clothing items. I don't really blog very much about me but I thought why not. Pink Clove has a fantastic range of plus sized clothing (sizes 16-28). As you may know I have a little bit of a love/hate relationship with my body - which I am currently working on. While I have lost a good amount of weight since I had Emily it isn't as much as I would like. I wasn't sure if the clothing would come up true to size on me, or if it would even fit. See the problem I have is I am a size 14 waist, but in tops I have to get a 18 as I am big busted. This means the clothing then looks massive on me because my waist is smaller than the rest of me - anyway enough about that. I am happy to say, I'm super happy with the three things I picked, so I thought I would share them with you. Pink clove have a fantastic range of plus size clothing (sizes 16-28). Translating the latest influential trends from the catwalks, Pink clove expertly designs to flatter the fuller figure. With trends constantly on the move we want to keep you on board with our wide variety of the latest fashions in evening and day wear. Our online store means you can visit whenever and wherever suits you. 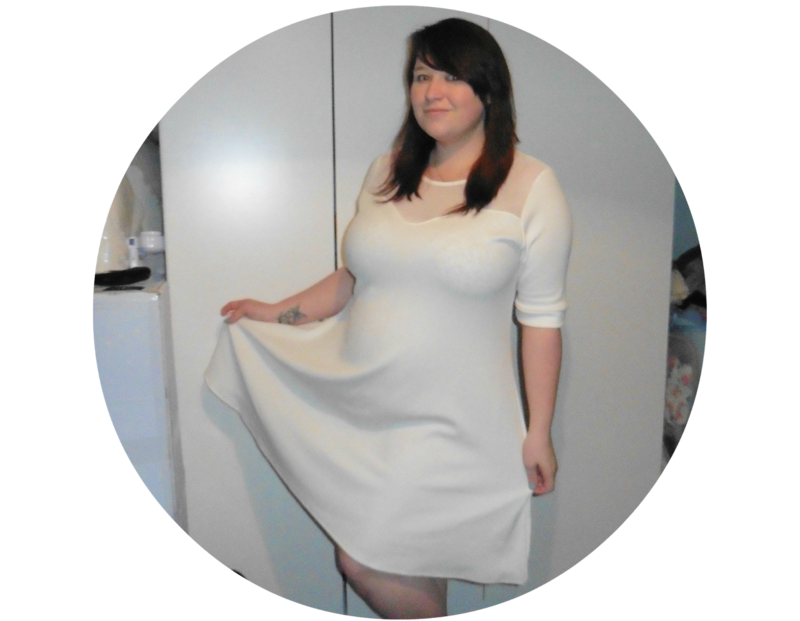 The first thing I picked was this Marsella mesh insert swing dress, I wouldn't normally pick a white or cream dress, but I wanted to go for something that I wouldn't normally go for. I absolutely love this dress, the material is really comfortable and has a shift shape. The material has a slight stretch to it, which comes in handy when your big busted. My favourite thing about this dress is the mesh detail insert at the top, I think it gives the dress a little something extra. The dress is priced at just £18 making it really affordable. The second this I picked was this Jana shirt dress. It has mock pocket detailing, and again is a white/cream colour. I really love this shirt although I feel like I need a smaller size. The other thing that bothers me - which isn't the product itself it is down to my body is the way the shirt hangs. As I mentioned I am quite big busted which means that the shirt seems to go straight down and make me look a lot bigger than I am. I love this product and will wear it again I think I may just wear it as a dress rather than a shirt and pull it in at the waist with a belt. Again the price was really reasonable at £20. The last thing I picked was this lounge long sleeved sweat dress, This is my favourite product. Being a mum I am all about comfort, and something I can just pull on. This slogan jumper is perfect for that. I love that it is slightly longer, and it is honestly the comfiest material, it is so so soft! I love the slogan 'Can't touch this' and really wish that I had this jumper while I was pregnant, it might have stopped all of that bump touching! This jumper was £20. Overall I am really impressed with the clothing from Pink clove. I will definitely be purchasing more from the website. I love the way that the clothing fits, and the fact the pieces are on trend. You look fab! It's amazing how many women I speak to who say they're unhappy with their bodies — we're so hard on ourselves aren't we? I think we're always our harshest critics ;) Love your slogan jumper BTW! The dress is a great fit, you look lovely in it. I would do exactly the same with the shirt dress and add a bright belt to it :) Love the slogan jumper, made me smile!